From U.S. Hwy. 12 or U.S. Hwy. 14, take University Avenue east onto campus. Turn left (north) onto Charter Street. Turn left (west) onto Linden Drive. Travel west to the intersection of Linden Drive and Babcock Drive. Russell Labs is the building on the northwest corner of this intersection. There are parking meters available on Linden Drive across the street from Russell Labs, near the Babcock Dairy Store. 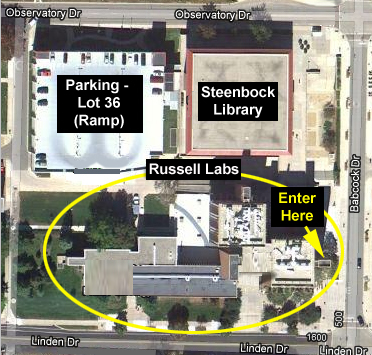 Longer-term parking is available in the parking ramp (Lot 36) located on the north side of Russell Labs on Observatory Drive (across the street from the Allen Centennial Gardens). From Interstate 90, take U.S. Hwy. 14/18 (the “Beltline”) west. Take the Park Street exit north into the city. Turn left (west) onto University Avenue. Turn right (north) onto Charter Street. At the third stop sign you will be at the intersection of Linden Drive and Babcock Drive. Russell Labs is the building on the northwest corner of this intersection. Come in the entrance show above. 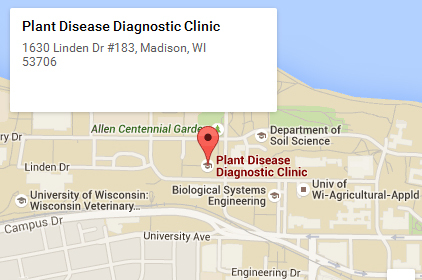 The Plant Disease Diagnostics Clinic (PDDC) is in Room 183, on the right side of the hallway. Due to construction, call the PDDC for up-to-the-minute driving and parking information. Clinic staff often may be out doing outreach work or may be working on samples in other rooms in Russell Labs. If you would like to talk with a PDDC staff member when you submit your sample, please call or email ahead to verify staff availability.